What can a clock do? To complain that clocks eat your soul is not only sentimental. A clock was part of the bomb that the ancestors of modern science laid under scholastic thinking in the 17th century. Scientific reason and its laws were in conflict with scholastic thinkers over the question of matter and form. For the scholastics “matter [was] unintelligible as such but require[d] a form, with which both the existence of individual beings [were associated].”1 Science, founded in “laws,” tended to make matter and form separable, by replacing a unique form with a general law. Scientific holism does not use living forms for experiments, because a random reconnection of the parts might damage the unique whole of the organism and its identity might lose definition. For the holist, the properties of the wholes might be objects of description but not objects for an experiment. In a laboratory clock, units are getting added, every unit in the system reiterates what happened just a unit before. One unit more—the experiment continues as predicted. The observer doesn’t notice the repetition, the line continues, the circle circles, the observer is dead. When one is a dead observer, the interesting things are happening outside of time, in the world of ideas. Only these timeless laws are seen to express scientific rationality. Rather than a place of creation, a laboratory is a place for getting calculated proofs. In an experiment the answer tends to be awaited and predetermined by the presuppositions of the problem and by the desire to succeed in the field. Another time the observer is alive, she takes a visual sample of an event. She sees two qualitatively different times in one instant. Instead of the extensive time of the experiment, she sees an event and its moments. The tension is rising while a culmination approaches. Every second accumulates an affect which passed past through the previous seconds. The observer has been waiting for 35 seconds, for her it is a 35th degree of waiting. Two types of seconds are involved: some pass away in the clock, others accumulate in an image and prompt the affect to the nth degree. +++3. to a catastrophe (nothing new happens in my life for too long). +++The closer the situation gets to the catastrophe, the more solitary the repetition becomes. In-differentiation can be the disaster of sameness in a repetition, as well as an object of fascination, like the total camouflage of a mimic.3 The simplicity of a unilateral withdrawal of interest from the Other towards a self-identity might strike the eye. However, having no interest in life, and being interested to observe such a life of no interest in all the details shall be distinguished. A good repetition would then be what allows a singular experience to “contract,” despite the repetition. This criteria confronts the observer with a concrete problem of navigating between difference and repetition. +++In a laboratory, the chronology records the stages of a process. A difference is registered through the correlation of time and form. From A to B to C to etc. Time is just a variable, that couples forms with rules of production. Time units are not different, the form differs in time. A good repetition then would be a non-chronological one, like a good film is never the same, all its moments are different time and time again. +++If all the moments are singular, then the question arises how to deal with the chaos of differences emerging too fast and too slow, how then to contract an experience, and at the same time how to escape thinking in terms of pure chance. The proposition would be to make yourself another time. A stratigraphic, superimposed time of geology, or a planet-like fast time of astronomy. Both can coexist with a time of countable juxtaposed units. +++Chrono-photographic studies combine geology and biology, or rather they suggest to look at what a body can do as if a geologist would observe a line in a stone. Long exposure turns the observed being into a choreographic field of causal relations. The method allows for a body to be seen like a stone, accumulated in time. The lines in the photo cyclographs of motions trace the developments and the self-difference of every repetition in a living system, disregarding the robust simplicity of the tasks, such as hammering, sawing, folding or packaging. The individuality of gestures is not reducible to the persona of a performer, they live on two different planes, in two different times. The latter is individuated as a work output per time unit, while the glowing line is still folding a handkerchief in the archive of the Smithsonian Institute. The arrow of extensive time is good for talking in terms of km/h, pieces/min, frames/sec in coordinated terms, but the speed is not the same as real hammering or sawing. A free line, on the contrary, is deformed and self-different at any point as time accumulates and conserves all the previous moments to extend into the current moment. None of the fragments of the curve is superimposable, it is folded but not compactable, it is developing but not predictable. In Berlin’s Neues Museum, last floor, prehistoric section, Palaeolithic Era. The speed of technology was somewhat comparable to a geological time, back then. To narrate changes a prehistorian invents a time. It shall connect a stone scrapper to whatever we have in our pockets today. The time of progress visualizes a series, a line of dots. The progress traces a development of differences of its kind. When a rupture in a series occurs, a historian tries to look for a more common or different denominator, that is capable to regroup the shapes and make for a convenient continuity. The progress of time commands mountains of stones to a morphological comparison and the classification in types. Different concrete instances are recognized and assigned to the classes in thought. Time follows from one genus to another, from one generality to another one. At some point the scientist noticed that in the Late Palaeolithic Age, when industry becomes increasingly elaborated, her protagonists are already capable of making abstract shapes. They do just what she does and vice versa. The Neanderthal person recognizes a future tool in an abstract shape, the scientist recognizes an abstract shape in a tool. Abstraction is a wonderful optimization process of production. It is equally efficient for a linear time of progress, in a flow production assembly line, and in Neanderthal industry. Abstraction transforms prehistoric intuition into productive scientific logic. There exists an affinity between the scientist and the experimental being, whose task it is to prove a hypothesis for the scientist. Far from being a passive construction, the experimental prehistoric being confronts problems together with the scientist and clashes with scientific enemies. separated from the core in one strike. This technique is believed to be the development of a simple reduction method, because it involves a different type of envisioning. Archaeologists understand the Levallois technique as an invention, a method based on abstract thinking—of planning an ideal shape ahead, not just going step by step. +++The guiding theme of further research for the contemporary proponents of this technique4 centers around the economics of the method: was the “abstract” method more efficient or not? Did the prediction optimize economy-wise or not? For an experimental prehistoric being, who was delegated by a scientist to inquire into the economics of its real double, the gain in time and the increase of production of the total cutting surface was significant. 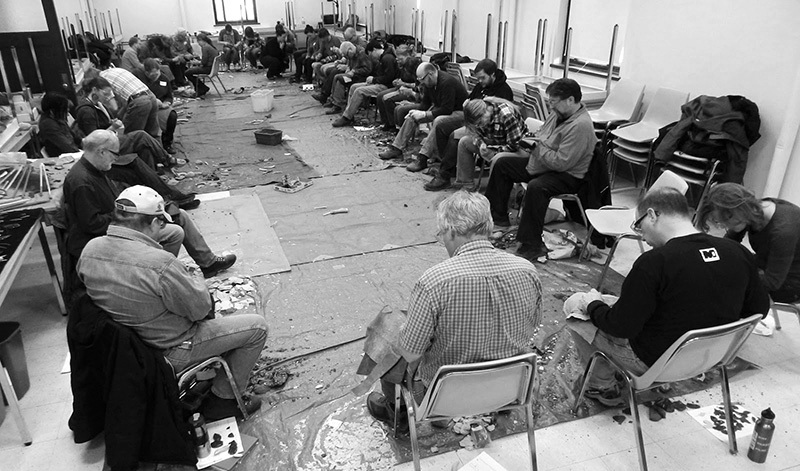 Therefore several scientists even learned the technique themselves and turned their laboratory into a workshop, measuring each others productivity of becoming Levallois knappers with a stop watch. +++In the Levallois model the scientific understanding of abstraction as generality structured the research several times. The first time when the envisioning was understood as imagining an ideal finished shape. The second time when the calculation of an economical efficiency was based on the output per time. And the third time when the existence of abstract thinking was proved by statistical morphological analysis, which singled out nine repeating tool-shapes made all over the world. +++One notices here a negotiation between science and economy for a definition of what productivity might mean. The first option reduces the variability of a step-by-step production to a few models. Once this is done a new efficient abstraction of a stone knapper and of a scientist emerges. An alternative would be to assume the priority of variation over repetition and by this to release a stone knapper from managerial concerns of future prediction and ideal shapes. An ideal is found in the interaction between attempt and failure—in a stubborn repetition of attempt and failure. A trivial medical observer sets up on measuring healthy bodies’ temperatures and naturally fails to get 36.6 all the time. There is a field of variability around the standard, even more, there is variability inside the standard: 36.66 and 36.613. More measurements are made—the field of variability becomes larger. An increase of resolution brings even higher variability. The noisiness of the variability belongs to science “by right,” according to Deleuze and Guattari. 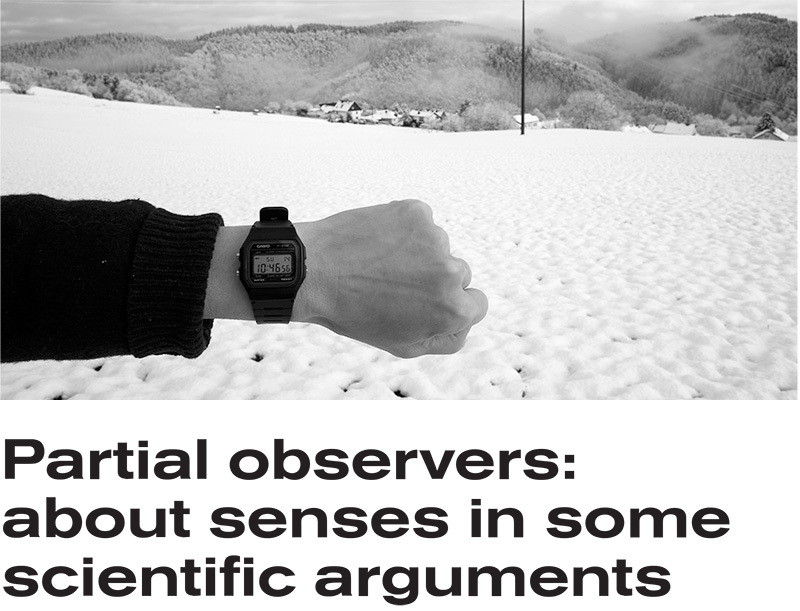 “Perspectivism or scientific relativism is never relative to a subject: it constitutes not the relativity of truth but, on the contrary, a truth of the relative, that is to say, of variables.”5 While a scientist would be ordering the variables in a system of coordinates preassigned by a reference, an observer would continue measuring without reference. The observer operates in continual series, in a variation of temperatures, in what is considered to be the noise of a system or of a model. +++Noise is holistic because it does not have an extensive unit, it cannot be explained as a sum of simple parts. The complexity of noise is similar for all levels of enlargement. For example, if one finds a periodicity in chaos, this island of order will have a region of noise, in which there will be a smaller island of order and so on. A great return of noise. This island is not a unit precisely because it is heterogenous. Measuring of a surface occupied by noise, quantifying its sq. units will not say anything about the noisiness of the surface. Extensive measuring won’t say much about the qualities of the noise in question. Noise emerges as the differential potential in the repetitions of cycles, in the zones of low dynamic range, in the twilight and at any time a system undergoes phase-changes. Noise was historically a systematic defect to overcome with the new HD technologies, but it has always been the most common generic element of any system. +++Despite the fact that noise is everywhere, it has been ignored by science because a litmus test of good scientific research is its repeatability and the transferability of its method. “In the Cartesian-Newtonian paradigm, to say that we can explain an event usually means that we can predict the event.”6 The patterns of noise are one of the romantic frontiers between science and chaos. Noise resists prediction by forcing universals to go local. Universalities are turning into attractors by introducing local necessities. To see the growing shape of an attractor, a formation of local development becomes more important than to foresee local developments on the basis of conventional universalisms. +++Noise fights prediction, it leans towards perception and experience, “although this perceptions and affections are not those of man, … but belong to the things studied. Man feels the effect of them nonetheless, but he obtains this effect only from an ideal observer, that he himself install like a golem in the system.”7 Scientific observers are sensibilias, they perceive and experience, and the delegated beings are acting as representatives of scientists. The former are qualities without subjetivities, they are usually assimilated by the latter. The problem of measurement, as in finding the extensions of objects, was updated by the concept of roughness. Roughness, might be said, describes a fractured surface between dimensions. Inter-dimensional tension causes planes to fold. Through roughness, complex shapes can be described as surfaces without unitary measurements like square or cubical centimeters, but they are still relative to the ideal forms to which they are imperfect heirs. If a being is characterized by a non-reducible complexity, its shape has an irreducible total continuity of folds and creases. The roughness of a shape will be an intensity of the relation between the ideal form and the living form, a scientific coefficient of realism. In this manner fractals are implemented in computer graphics, pushing the realism of animated surfaces beyond the images previously seen. +++One more surface to look at: a territory which consists of many other territories, each of which is defined by a liquid color, maybe watercolor. The diffusion on the borders makes new shades, nuances and colors, thus a new territory grows through each border. On this surface changes in color take place. In a temporality of fusion standards get confused. When one is a capitalist who faces the limits of a working day, she needs to intensify labor, to push working time past its previously known limits: e.g. to fit yesterday’s 2 hours in today’s 33 minutes. Exploitation has had, if not scientific, then most of the times rational self-explanations. Henry Bergson opposes the intensification of units, roughness of working speed, by proposing an alternative model. Instead of compressing an activity in ever shorter intervals of time, Bergson treats duration as the total continuity of time. In his “athletic” example he proposes to think of time as if it was a rubber band. “Now” would then be the same rubber band, contracted to a mathematical point. The band stretches as time passes. Time should not be thought of as related to a force applied to the rubber from the outside. To observe time as a continuity one shall “become” a rubber, become a rubber observer. The trick is in the way how this rubber observer treats force. For her, force is not an action applied to something, but a sensation of something perceived. For the proper observer time is duration: it is continuous, differentiating and indivisible, it contains no discrete units. +++Photo-cyclographs of movements contain free lines of this kind, but sometimes layered with grids. The units of the grid allow for direct comparison between the different takes of an operation, they establish similarity between the repetitions. The original task of the photo-cyclographs to increase surplus value is achieved by establishing a reference unit for comparison and as the limit to overcome. Surplus proceeds: from attempt to failure—stop—repeat—compare. An uncanny match between surplus production and critical subjectivity. 1+++Isabelle Stengers, Cosmopolitics II, (Minneapolis, London: University of Minnesota Press, 2011), 210. 3+++Surrealist sociologist Roger Caillois provides an example of an absolute deindividuation in the insect kingdom. In Mimicry and Legendary Psychostenia he describes how the tree insects Phyllidae get mesmerized by their own perfect camouflage and start to graze on each other instead of real tree leafs. Caillois compares their habitat with a self-devouring milieu. 4+++Works of the archaeologists Adler D.S., Eren M., Lycett S.J. argue that the Levallois method shall be compared with modern understanding of engineering methods. 5+++Gilles Deleuze and Felix Guattari, What Is Philosophy, (New York: Columbia University Press, 1994), 230. 6+++Vernon Howe, “Chaos: A New Mathematical Paradigm” (paper presented at the International Faith and Learning Seminar, Berkshire, England, June 1994). 7+++Gilles Deleuze and Felix Guattari, op. cit., 230. Mikhail Lylov is an artist currently based in Berlin, and originally from Voronezh (anecdotically the city with the highest recorded number of UFO sightings in the world). He is one of the artist to answer and discuss our invitation to think about time, time machines and machines.